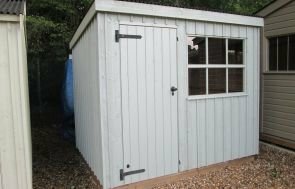 This 1.8 x 2.4m National Trust Peckover Garden Shed has been installed in our customer’s garden, in Buckland, Surrey, next to their traditional looking conservatory. They intend to use the shed as a quaint looking potting shed to work on their garden from, a wonderful little gardeners retreat. As part of our National Trust Range, this building was inspired by National Trust Outbuildings, incorporating features such as corrugated roofing material, vertical cladding and cast iron door furniture, intended to promote a traditional aesthetic. Each of our National Trust sheds is finished in vertically-sawn FSC® certified timber boards which offer a more traditional look and feel. The FSC® certified timber that we use is Scandinavian Redwood, and it is slowly grown for over 130 years in Northern Sweden to make it denser, stronger, and less prone to dead knots than normal timber. 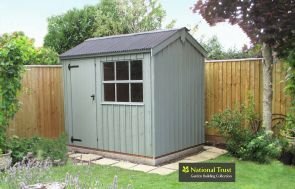 The paint is National Trust paint, in Wades Lantern; this is a natural colour that blends in well with the natural colours of the garden around the shed. All of these features equate to a shed that is very traditional in style, and one that perfectly suits our customer’s garden.